The Pipe Stacks pays tribute to the previous use of the site as a concrete pipe factory, Hume Pipes, and the revolutionary advancements made by its founder Walter Hume. 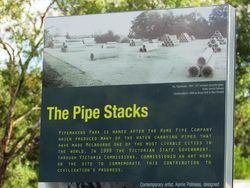 Pipemakers Park is named after the Hume Pipe Works. The sculpture was designed by artist and museum associate Kerrie Poliness and built in 1999 funded by Arts Victoria`s program of the "Victoria Commissions." 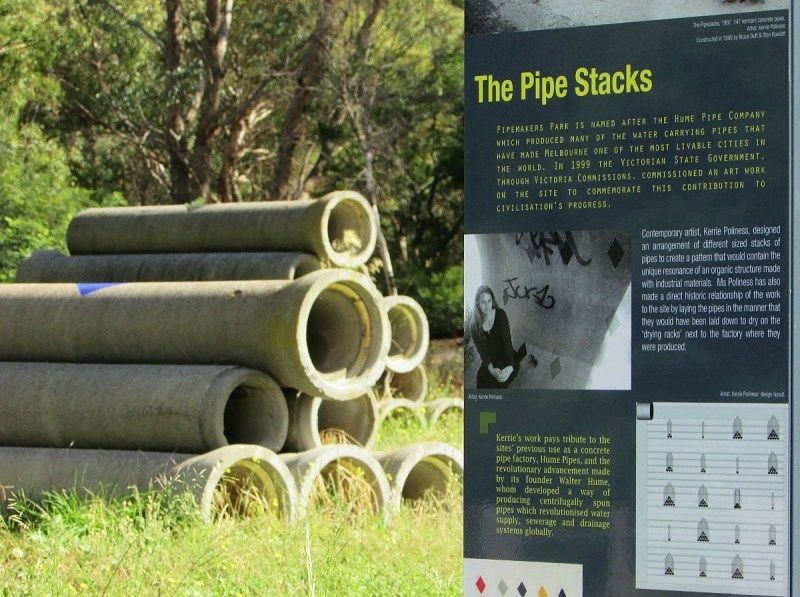 PIPEMAKERS PARK IS NAMED AFTER THE HUME PIPE COMPANY WHICH PRODUCED MANY OF THE WATER CARRYING PIPES THAT MADE MELBOURNE ONE OF THE MOST LIVABLE CITIES IN THE WORLD. IN 1999, THE VICTORIAN STATE GOVERNMENT, THROUGH VICTORIA COMMISSIONS, COMMISSIONED AN ART WORK ON THE SITE TO COMMEMORATE THIS CONTRIBUTION TO CIVILISATION`S PROGRESS. Contemporary artist, Kerrie Poliness, designed an arrangement of different sized stacks of pipes to create a pattern that would contain the unique resonanace of an organic structure made with industrial materials. Ms Poliness has also made a direct historic relationship of the work to the site by laying the pipes in such a manner that they would have been laid down to dry on the 'drying racks' next to the factory where they were produced. Kerrie`s work pays tribute to the sites' previous use as a concrete pipe factory, Hume Pipes, and the revolutionary advancement made by its founder Walter Hume, whom developed a way of producing centrifugally spun pipes which revolutionised water supply, sewerage and drainage sustems globally.